For decades, liberal democracy has been extolled as the best system of governance to have emerged out of the long experience of history. Today, such a confident assertion is far from self–evident. Democracy, in crisis across the West, must prove itself. In Intelligent Governance for the 21st Century, Nicolas Berggruen and Nathan Gardels critically compare the West’s liberal democracy and the East’s meritocracy. Can we learn from both? Dennis Shen believes the book is a great read and an important critique of modern times. Intelligent Governance For The 21st Century. Nicolas Berggruen and Nathan Gardels. Polity. 2013. Is there a middle way between China’s meritocratic single-party system and the United States’ multi-party liberal democracy? This is the question that authors Nicolas Berggruen and Nathan Gardels ask in their provocative book, Intelligent Governance for the 21st Century. The authors take a step back from the Western determination that liberal democracy is the only pragmatic government form, to ask whether democracy is an end in itself or whether it is a means to an end. To this, an Eastern contention that multi-party, electoral politics is vulnerable to capture by short-term and divisive special interests needs to be debated openly. In a book that does not take sides, but instead ventures to be practical, the authors contend that both China’s meritocracy and US-style democracy are incomplete and flawed. China’s meritocracy lacks the legitimacy and does not have enough institutional checks, but democracy in the US is broken due to the immediacy of demands for liberty and consumer plenitude; cultural habits that undermine long-term and sustainable policy planning. The authors reference John Rawls in the argument that in modern democracy, uninformed individual voters vote for self-interest rather than the common interest. Is this not a central problem? Berggruen and Gardels provide readers with a short historical overview in the chapter ‘Liberal Democratic Constitutionalism and Meritocracy’. An association is presented between China’s modern governance and its ancient Confucian values. Might China’s history, rooted in Confucian principles of meritocracy, ethical accountability, loyalty and social harmony, be the root of its institutional civilisation and modern one-party state? Multiparty competition is rejected in China in favour of unity from special interests, but perhaps this does not preclude an internal competition of views from expression by factions inside the party. The Communist Party’s legitimacy is derived not from input accountability (elections) but output accountability (results) – but does this system have both pros and cons? The authors note that China’s model, absent change, will meet resistance in a time of better-informed and better-connected citizenry. To this, it is added that Singapore’s People’s Action Party (PAP) and China’s Communist Party were both built to rule a de-centralised rural-agricultural order, but now their societies are half-urban and more complex. To explore the scope for reform, Berggruen and Gardels explain that China has turned its back on the communist ideology and on ideology itself to be practical and interchanging – there are signs to this indeed, but it is surely to be tested in the coming decades. The book’s discussion on the history of Liberal Democratic Constitutionalism in the United States is equally critical and provocative. The authors note that the US Founding Fathers, the Federalist party, had an aversion to multi-party, direct democracy, and believed in government for the people, rather than government by the people. In step, the Founders designed institutions that included the Electoral College, an appointed Senate (until the early 20thcentury, the Senate was chosen by state legislatures) and the Supreme Court that would balance electoral politics with independent, knowledge-intensive institutions. Perhaps as interesting in this debate is the reference to Thomas Jefferson’s view that constitutions normally run their course within 20 years. These points will be revealing to those that indiscriminately look to the Founders and the US Constitution to defend principles in popular, multi-party democracy, the infallibility of the Constitution and individual rights. To this, the authors argue that the United States today is no longer the agriculture-based landed aristocracy in which the American political system and its constitution were originally conceived – and just as times have changed, the political system must too adapt. The central argument is that the Western political system, like any system, has its weaknesses, whether structural or created by the evolution of civilisation, the changing of institutions of governance must always be debated. 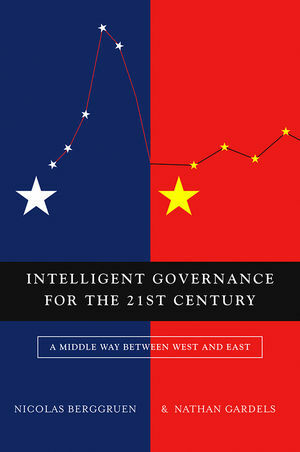 Taking lessons from the successes and challenges of the East and West, the authors conclude that the keys to intelligent governance is accountable meritocracy and knowledgeable democracy. Today’s meritocracies need to become more accountable and today’s democracies need knowledge-intensive institutions. The illustrative example on how such a middle system between meritocracy and democracy could look is presented in the chapter ‘Intelligent Governance: Tenets and Template’. In what is a liberal proposition that is bound to start heated debate, the author’s design hopes to improve competency, independence and efficiency in government, mixed with checks-and-balances via citizen participation, a free media and independent monitoring bodies. In the authors’ blueprint, government is premised on an indirectly elected lower house and an appointed upper house. In multiple ways, the authors’ recommended structure has parallels to the Westminster system today in the UK. The heart to the proposal is an innovative pyramid structure to the indirectly-elected lower house. The authors hope to design a system of intelligent governance that both devolves power and involves citizens, whilst delegating authority at higher levels of complexity; concepts that readers may have interpreted to be in conflict prior to completing this chapter. “Intelligent governance is anti-bureaucratic. Government should be smart, but also as lean as possible – strong but limited. The issue is not big or small government, but good governance in which power is decentralized and distributed where appropriate and authority is delegated where competence dictates” – one can hope, and this thought-provoking book by Berggruen and Gardels is a great read and important critique. Dennis Shen has worked as member of the global economic research team at Alliance Bernstein in New York and London, specializing most recently on Europe. His research interests include international political economy, global governance and environmental regulation. He completed undergraduate studies at Cornell University and is currently reading the MPA in International Development at the London School of Economics. Read more reviews by Dennis.